I blogged about this pattern (it’s Oriental Lily from Ravelry) in this post. Now if she’ll just wear it. I was able to get this modeling session only because I promised that she could take the dress off (and put on her Sleeping Beauty costume) immediately after I took the picture. Sigh . . . it’s a tad big for her, so hopefully her taste in clothing will change soon and she’ll wear it before the cold weather ends. Right now she wants to wear only costumes: some days it’s Alice in Wonderland, some days Ariel or Sleeping Beauty, some days Dorothy (y’know, the Wizard of Oz Dorothy). Here’s part of the haul on a recent harvest day at Etc. Farms. I love how the carrots look like Rockettes kicking up their legs. (That’s Rockettes, not roquette, although we grow that, too!) 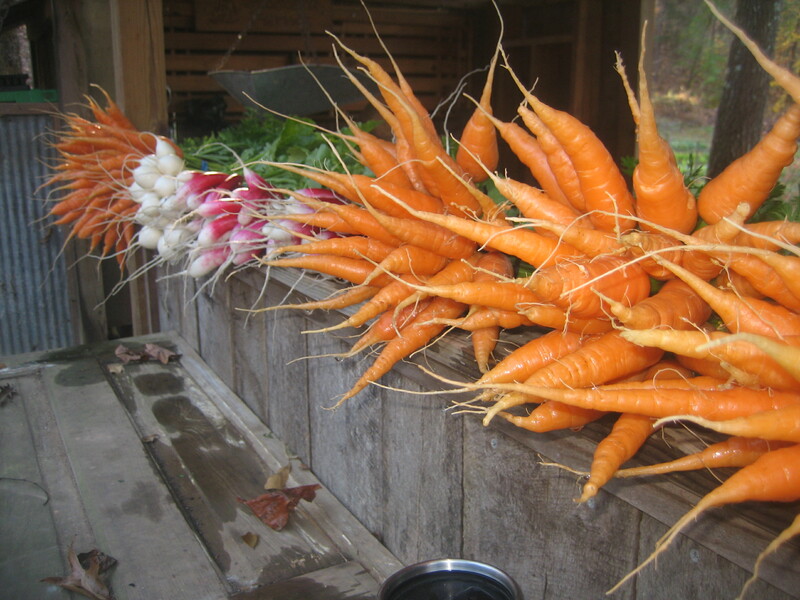 Just beyond the carrots are French breakfast radishes and then Hakurai turnips, and more carrots – yum! The carrots are super for winter growing. They can be left in the ground through the coldest months and pulled whenever you want. They are a variety called Hercules. We get all of the seeds for these three great veggies from Johnny’s Selected Seeds.